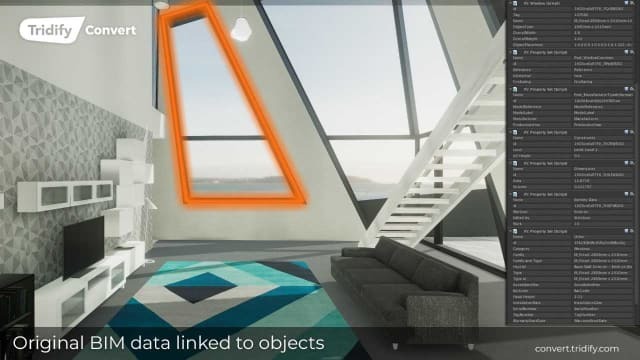 At the end of last year, game engine Unity and BIM conversion company Tridify announced that they’d be partnering to create conversion software that would allow users to bring BIM files into Unity without losing any of their data. Tridify Convert is a project five years in the making, a long time in the fast-paced world of software. But exactly how does Convert work, and what was the process behind getting the software to market? 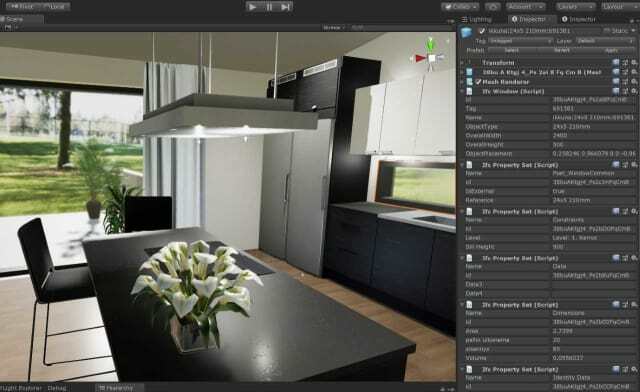 The most significant feature of Tridify Convert is that the software makes it possible to bring BIM and CAD models into Unity’s game engine without losing the associated BIM data. The BIM information is carried over in the form of an Industry Foundation Class (IFC) file export connected to the model, which gets automatically turned into a COLLADA file upon upload into Unity. Convert also includes a toolset that lets you automate common functions, like mapping materials and textures onto models. Convert delivers models that are UV mapped—meaning that the model has a surface texture, whose axes are labeled “U” and “V”—and the material replacing tool automatically takes the materials from the BIM model and allows the user to replace them with Unity textures. 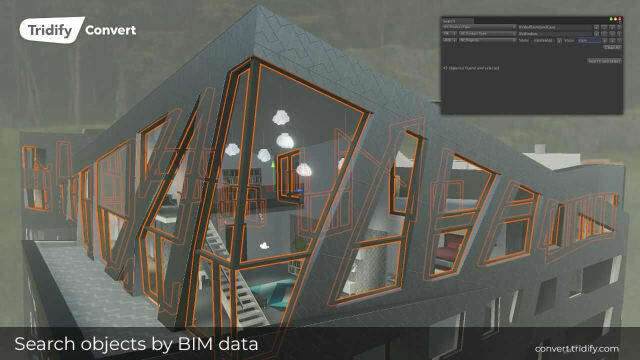 The light generation tool automatically adds basic lights to every room of a building model, and the advanced search tools let users search BIM data to find specific objects and product data. Tridify Convert’s main mission is to save designers time. “To get from a BIM model to a basic ready-made Unity application with lights, materials and walk through abilities takes hours instead of weeks,” said Alanen. Maybe it’s ironic that such a time-saving software had a long path to get to market: Tridify has been developing a solution for the past five years. Tridify's journey into the world of virtual reality started with Tridify RT, where users could create interactive virtual environments in which to place their 3D assets. Users could perform functions like moving furniture around inside digital models to help plan out the space. The BIM-to-3D conversion technology was initially developed as an internal tool to help users manage files in Tridify RT. "However, our clients started to ask to use our technology by themselves, and we decided to open the technology for anyone creating virtual solutions and focus solely on automating the virtualization processes," explained Alanen. According to Alanen, the Tridify team used Unity to help develop its internal tool "over five years ago." And when it came time to take it external, Tridify reached out to the other company as a partner. “Our R&D team recognized that by working with Unity, we could deliver a solution that would automatically streamline the process of delivering UV-mapped and optimized architectural models to XR-ready 3D files. Together, with Unity, we are solving the problem of repetitive, slow and error-prone remodeling," he said. Since then, the two companies have been working together closely. Of course, both companies still have their own independent deals. Just a few weeks before Tridify and Unity unveiled their partnership, Autodesk announced that it was going to integrate Unity's engine directly with Autodesk's design tools. But Tridify doesn't see that as a risk to Tridify Convert. “The goal of the Autodesk/Unity partnership will be to streamline the workflow from BIM to game engine. Tridify already contributes to this objective through our Tridify Convert service, which can be used with all leading design tools in the Unity development environment, including those from Autodesk's suite," said Tridify CEO Alexander Le Bell. In other words, Convert will still be able to enhance the Autodesk/Unity connection, and its usefulness extends far beyond just Autodesk files. Le Bell also cited the timeline on the Autodesk/Unity partnership. While the Autodesk/Unity connection will be available in late 2019, "Convert is available today and is already delivering benefits to users industry-wide." So far, Tridify Convert has been released to a generally positive reception. Beta tester Logan Smith says that while Tridify isn’t the only way to get a Revit model into Unity, “it’s just, in my experience, the best right now.” He's still hoping for a bidirectional link between Unity and the BIM original—so the original file registers changes made to the Unity version—and a way of turning the software he custom programs for clients into a reusable tool in the system. “That’s not there yet. But I see no reason it can’t be soon,” he said.